The ABS modelling language targets concurrent and distributed object-oriented systems. The language has been designed to enable scalable formal verification of detailed executable models. 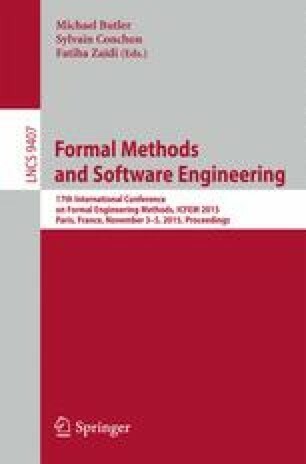 This paper provides evidence for that claim: it gives formal specifications of safety properties in terms of histories of observable communication for ABS models as well as formal proofs of those properties. We illustrate our approach with a case study of a Network-on-Chip packet switching platform. We provide an executable formal model in ABS of a generic \(m \times n\) mesh chip with an unbounded number of packets and verify several crucial properties. Our concern is formal verification of unbounded concurrent systems. In this paper we show how scalable verification can be achieved by compositional and local reasoning about history-based specifications of observable behavior. Supported by the EU projects FP7-610582 Envisage: Engineering Virtualized Services (http://www.envisage-project.eu) and FP7-612985 UpScale: From Inherent Concurrency to Massive Parallelism through Type-based Optimizations (http://www.upscale-project.eu). The authors gratefully acknowledge valuable discussions with Richard Bubel.